There is so much well-deserved attention focused on the 50th anniversary of the Beatles US arrival and appearance of on The Ed Sullivan Show. But here's a bit of interesting history. In the 1960s, when Paul McCartney was dating Jane Asher, he was often found hanging around her family's house. Asher's parents took pity on him and offered him the guest room at the top of the house as a pied-à-terre. When McCartney wasn't on the road, he shared the room with Jane's brother, Peter Asher (pictured with McCartney below). "During that time," Peter recalls, "I got to hear songs in various states of creation which Paul played, and one of them was this unfinished song called 'World Without Love.' All he had was a couple of verses. John didn't think it was right for The Beatles. Nobody jumped on it." 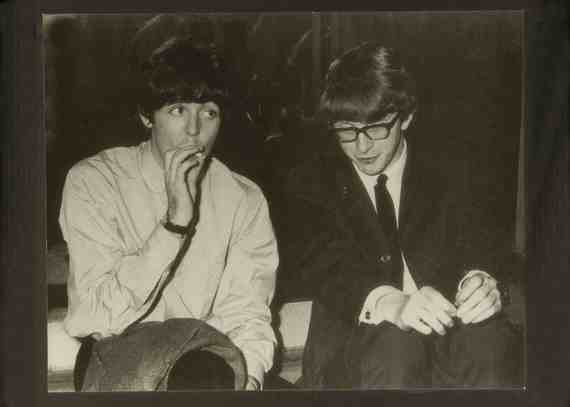 Some months later, Peter got a record deal with his own group, Peter and Gordon. So Peter asked Paul if the unwanted song was still around. It was. "World Without Love" hit the top of the charts. It's one of two songs written by Lennon and McCartney to reach number one in the United States as performed by an artist other than The Beatles (the other being Elton John's version of "Lucy in the Sky with Diamonds"). Peter Asher went on to be a superstar record producer and produced successful albums for James Taylor, Cher, Linda Ronstadt, Neil Diamond, Bonnie Raitt and many others. Over the years, famous artists have written hit songs for others. (Or sometimes other artists end up recording them and making them really famous.) And some of the songs might surprise you! To learn more, read the full story at Parade.